Priceline has long been one of the smartest players when it comes to mergers and acquisitions and it looks to have made another key move with its recent investment into Meituan-Dianping finds EyeforTravel’s new report into the company. Priceline just strengthened its Chinese market position by investing into Meituan-Dianping, one of the fastest growing players in the Chinese digital space, showing its ambition in international expansion and giving it a new edge says the report into the online giant. In October 2017 Meituan-Dianping announced the investment as part of Series C funding into the start-up, which brings together group buying, booking and reviews. It is a rapidly rising power in Chinese online travel thought to be behind only Ctrip and Qunar. Reportedly, Meituan-Dianping recorded more than 18 million room night bookings in July 2017 alone and claims to have meteoric growth rates that are quickly making it one of the world’s top start-ups by reported valuation. In the latest round of investment the company was able to raise USD4 billion, giving it an estimated value of around USD30 billion – a valuation that would put it among the biggest of the emerging tech companies and perhaps even bigger than Airbnb. Although Priceline has a comparatively small stake in the company, with its investment reportedly valued at USD450 million, it also announced that it was to create a distribution partnership between the company’s travel division and Priceline’s main Asian arm, Agoda. This is potentially more crucial than the investment itself and likely what Priceline was mainly looking to get at in the funding round. With a predicted Compound Annual Growth Rate (CAGR) of more than 8% between 2017 and 2020 and even a faster growing domestic market, the attraction is obvious for Priceline and getting involved with local players at this stage could be crucial as EyeforTravel’s research suggests that more than seven out of ten digital travel bookings in China are made with Online Travel Agencies (OTAs). To preview and buy EyeforTravel’s Expedia report, click here, or here for the Priceline report. 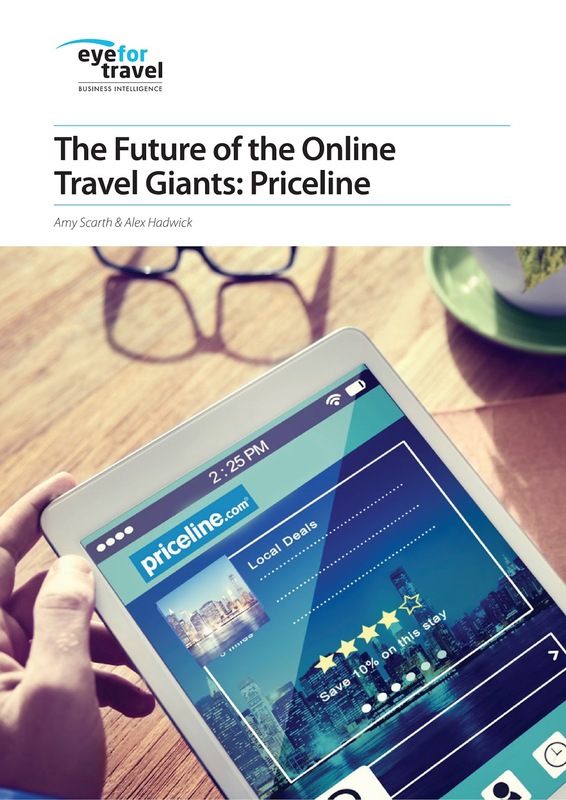 These are part of the Future of the Online Giants series, which will cover Expedia, Priceline, TripAdvisor, Ctrip and Google. Keep a look out through EyeforTravel On Demand for the rest of these reports. Can Expedia transition to the travel industry’s tech partner? 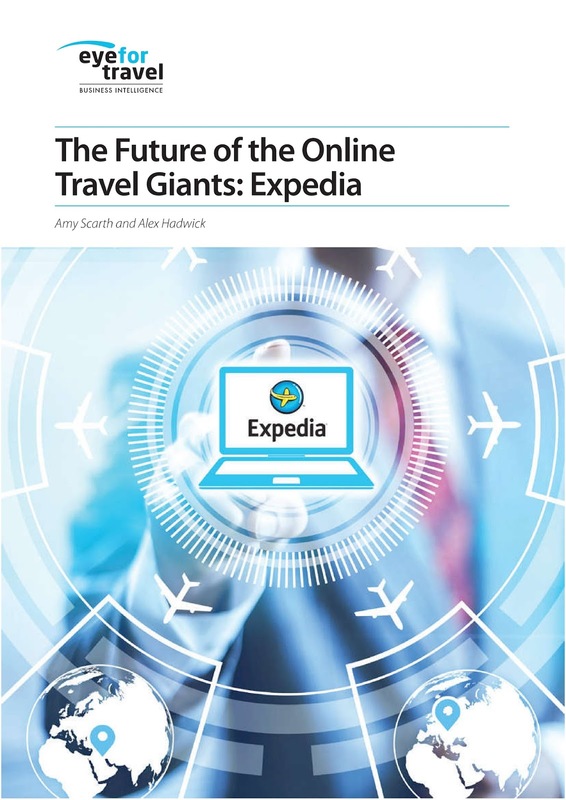 A transition appears to be underway as Expedia increases the number of technology solutions it offers and builds partnerships out across the industry but will this strategy succeed asks EyeforTravel’s new report into the online giant? A subtle change appears to have happened in the online travel environment. Emboldened by changes to regulatory frameworks, new technologies and growing revenues, travel suppliers are fighting to claw back market share. In response, Expedia appears to be pushing a new strategy to ensure future growth by growing its partnerships and services to support the industry according to a new report into the company. Expedia sees opportunities in facilitating services in the travel industry and mobilizing its technical expertise to enhance its position at the center of travel distribution through partnerships and offering a full spectrum of travel products that are personalized for consumers, whether they are buying a hotel room, rail ticket or a whole package. · Private Label Packages: Expedia worked with Marriott to create Marriott Vacations where the hotel chain uses a dynamic packaging platform powered by Expedia so their customers can book flights with accommodation, and earn Marriott Rewards when they book. Expedia has since built this out into a white-label option and has signed on Barceló and Omni Hotels & Resorts to the dynamic packaging system. · Partner Loyalty Enrollment: Red Lion Hotels initially kicked off this development as the first to have its own loyalty scheme actively promoted by Expedia in search results. Expedia claimed that there were three hotel chains signed up in August 2017 to the product, which allows users to enlist bookers directly to their loyalty programs from Expedia sites and in December 2017 announced that G6 Hospitality had signed up to the scheme. · MICE Booking Technology: Expedia began testing their new MICE platform in mid-2017 and are hoping for a major roll-out in the near future. The system is a front-end booking tool and a back-end management and analytics platform. · Rev+: This is a B2B service for revenue managers of hotels, free to those already part of its distribution network, that runs of Expedia data and appears to be an attempt to provide a rival to BookingSuite. · TravelAds Direct: Seemingly a reaction to book direct efforts, especially as Expedia’s official release stated that it offers “easier price comparison for consumers, and more potential brand touch points, bookings, and loyalty for hotels,” TravelAds Direct is CPC advertising that refers to hotel brand sites. · Accelerator: Finalized in Q4 2015, this product allows hotels to bid against each other, transforming the search results into a marketplace where hotels pay commissions for the top listings, increasing their chance to be booked by a traveler. This could be part of their strategy to compensate for lowering ADRs, as well as gain a share of online advertising revenues and sweat the assets of their platforms. The number of products and interest in pushing these out to major partners suggests a larger strategic focus on the area and a divergence from the approach of its biggest competitor, Priceline. Expedia has long thought of itself as a full-service travel agency, providing products that cover the entire travel spectrum. However, this advantage has narrowed as a growing universe of Application Programming Interfaces (APIs) and cloud platforms allows smaller players to access far more inventory than they previously would be able to. Whereas setting up agreements to sell car rentals, flights, or tour activities would have been technically and legally arduous to set up for a smaller travel company, they can now work through third parties and a single agreement can open up a global supply network. 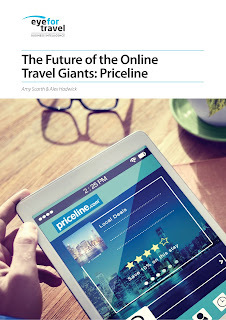 Priceline and Expedia continue to grow but at what cost? They are still growing strongly, but Priceline and Expedia are increasingly reliant on marketing spend to drive expansion and this could leave them with vulnerabilities, finds EyeforTravel’s new reports into the two companies. Both Priceline and Expedia continued to post some impressive growth numbers in their Q3 results, with double digit rises in gross bookings but these increases appear to come at an ever-increasing cost and concern is rising among investors. EyeforTravel’s new reports into both Expedia and Priceline finds that investors are right to be concerned as this is a potential weakness for both companies that empowers potential rivals in the form of the main digital advertising giants Facebook and Google. Both companies saw soaring costs in 2016 continue into 2017 and appear to be trapped in a competitive spiral, focusing on matching increases in the other’s marketing spend for fear of falling behind. In 2016, Priceline increased its brand advertising spend by 8% and performance advertising by 27%, whilst Expedia saw selling and marketing costs rise by 29%. Through the first three quarters of 2017, marketing spend by Priceline has grown by 22%. In percentage terms this matches a 22% increase in the broader ‘selling and marketing’ element of Expedia’s costs across the same time frame. For the latter, selling and marketing costs now make up more than 55% of the company’s overall costs, whilst Priceline's combined selling and advertising costs make up 70% of overall costs. There can be little doubt that the majority of this spend is heading over to Google, with Priceline appearing to be the more reliant on the search giant currently. Around three quarters of search engine traffic to Booking.com is generated via paid advertising, as compared to around half for Expedia. This also comes despite Expedia paying less in advertising than Priceline but is nonetheless a concern for both companies as Google continues to relentlessly but quietly ramp up its travel products. Not only are the two facing pressure from each other and the online travel agency market, but increasing pressure from their suppliers as well, as they try to recapture market share through book direct campaigns. Most of the major chains have initiated these alongside a broader consideration of what loyalty means in the industry. Combine this with a more combative regulatory environment in Europe, with wide price parity agreements being eroded, and what they will get is more competing forces for keywords and users’ attention across a wider number of search terms. This has caused ripples on Wall Streets, with analysts focusing in on the growing costs and their effect on the bottom line as profit expectations are missed. After Q3 2017 earnings call for both companies, stocks plummeted, falling nearly 16% for Expedia the day following the call on 27th October and 13% for Priceline on 7th November. For Priceline this mimicked a similar stock drop following the Q2 earnings call, highlighting investor concerns. Investor concern is unlikely to dissipate as these two are reaching such gigantic proportions that their growth is likely to slow naturally anyway and there doesn’t seem to be a way out of the marketing spend increases on the near horizon, with search engine marketing critical to their business models. Indeed, currently their ability to outbid almost any other player when required and their vast data regarding search term effectiveness currently makes this arena a competitive advantage for both players. Expedia wants to expand outside the North America but making inroads into the world’s most influential travel market will be a tough ask in the face of increasingly fierce competition finds EyeforTravel’s new report into Expedia. With a projected compound annual growth rate in outbound journeys of 8% to 2020 and an even faster growing domestic market, Expedia needs to get a slice of the Chinese market but since its sale of eLong, the competition has only got stronger and it may be too late to make inroads according to EyeforTravel’s new report into the company. 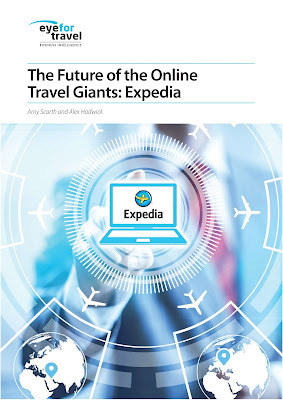 Expedia faces not only a series of rapidly growing brands that are beginning to establish themselves but an increasingly interconnected web of investments between these players that threatens to lock them out of the market. The key player is Ctrip, which is now reaching a point of near-dominance in the market. Other key brands in the market include Qunar, eLong, Tujia, Alitrip, and Meituan-Dianping, making it a competitive market place, but already several of these brands are falling under key rivals. Ctrip is the biggest player in the field, snapping up Expedia’s former brand in China, eLong, alongside Qunar, and it also has a subtantial investment into Tujia. Expedia’s great rival Priceline is also deeply embedded into the market. It has investments and distribution partnerships with both Ctrip and Meituan-Dianping, tapping into two already key players, with explosive growth rates. In the case of Ctrip, Priceline’s investment gives them up to 15% of the shares in the company and also an observer on Ctrip’s board, allowing them a degree of influence in the company, one that is unlikely to be friendly to Expedia. Although Expedia’s weakness in the market is noticeable, it’s not just Expedia that has struggled in the Chinese market. Other tech giants, such as Uber and even Google, failed to truly make inroads despite putting in big investments, emphasizing the complexity and unique dynamics of the market. It appears that for now Expedia is choosing to focus on other Asian markets, recently announcing that it is investing into regional OTA player Traveloka. Traveloka focuses on Southeast Asia and Expedia reported in 2017 that the area is its fastest growing regional market. Nonetheless, the situation leaves Expedia largely bereft of options to open up the Chinese market currently and potentially facing a very large bill if they do want to establish themselves, both in marketing and platform terms. However, one potential route in the long term might be through its investment into SilverRail. Rail travel is already critical in China, making up the largest segment of the digital travel market in the country and is set to grow substantially in the coming years. A foothold in rail therefore could be a key competitive advantage, especially as Priceline is so heavily focused on accommodation and not as diversified in terms of revenue streams as Expedia. However, it remains a longshot in the context of an increasingly powerful number of localized and interconnected players. Are hotels focusing enough on the stay? 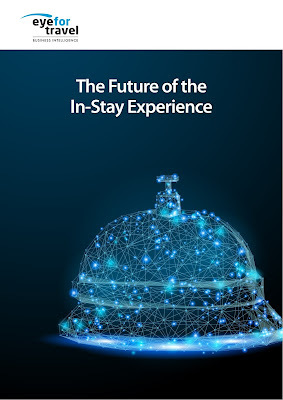 The following is the introduction from EyeforTravel's new the Future of the In-Stay Experience report. Hospitality businesses live and die by their reputations but are accommodation brands really focusing enough on the one moment where they have the guest’s complete and undivided attention: The stay itself? It is these crucial moments when they interact to request a service, such as check-in, a spa treatment or for local recommendations, that will last longest in the guest’s memory. Now, there are new possibilities to improve the guest experience as technologies open up and fall in cost. The future of the stay will be one where the guest can use their own device to interact directly with the hotel’s staff or even the hotel itself through AI-powered interfaces. Customers will be able to call on far more services, and staff will be more connected and effective. Hospitality companies’ key objectives currently are to drive loyalty and improve the customer experience in the hope that this will drive down acquisition costs by creating repeat guests. Although the pre-stay digital area is important and has received a lot of focus recently, it is the quality of the experience when they are in the property itself that will truly generate long-term loyalty and strong review performances. From a marketing perspective, it’s the one time that they have the guests’ complete attention. Potentially it represents a key competitive advantage for accommodation suppliers, as they compete against themselves and against the online travel agents (OTAs) to grab and maintain the guest’s attention. This paper will demonstrate the solutions that allow hotels to facilitate better guest-focused services and communications. We talk to the leading tech firms in the field, break down the changes happening already and what hospitality brands should be looking to implement to secure their guests’ loyalty in the years to come. EyeforTravel's new report is out now and completely free for you to download. It covers the growing sphere of in-stay technology focused on improving the guest's experience and hotels' relationships with those guests. From the moment a hotel takes a guest’s booking they have an unrivalled marketing opportunity. The guest is theirs to build a relationship with and a growing wealth of technological solutions are springing up to handle this before, during, and after the stay. Through smarter properties and systems, hotels can build up complex guest profiles that can be used to improve almost every aspect of property performance and therefore the guest’s experience. What’s more these technologies are becoming cheaper and more accessible through mobile apps and cloud computing. The future of the stay will be one where the guest can use their own device to interact directly with the hotel’s staff or even the hotel itself through AI-powered interfaces. Customers will be able to call on far more services, and staff will be more connected and effective. Download this completely free report now and find out what the emerging technologies are, who is providing them, and how they can help to transform your business and your relationship with the guest. The tech and tools available to create better guest stay. What tech companies are working in the field and what solutions they can provide. How to work with changing consumer technologies and behaviors. How to improve pre-stay messaging. How property management systems are developing and what this means for hotels. What the future of the guest stay will look like. The real-world results of implementing technological solutions. How staff can improve their performance through new technologies. How hotels can gather and utilize the new wave of data coming from emerging technologies.